For the photo a day meme: a photo of one of your pets. I always post photos of Zen, so this one will be of Torgi. He is the cuddliest cat I’ve ever met, and especially loves head-butting for kisses. So today I read about 300 pages in “Twilight”, washed the bathroom floor, scrubbed the toilet and sink and part of the shower, did the dishes, organized presents, edited some poetry, and wrote two holiday cards. That’s all: two cards. I have no idea how I am going to get these out before New Year’s. Saturdays make me a little wiggidy, to be honest. I usually feel guilty for having the day off because FunkyPlaid doesn’t. Today he and just one other employee ran the whole store, open to close. After FunkyPlaid got home, he collapsed on the bed and didn’t even stay awake for the scotch I poured him. Torgi jumped up, curled up, and that was that. I believe that is about to be that for me, too. Every night, Torgi the cat puts me to bed by chirping and nudging me until I stop doing whatever I am doing. Every morning, he head-butts me into consciousness because it is time for his breakfast. Zen, in contrast, cannot be bothered. Her whims are her own, not to be shared with silly humans. 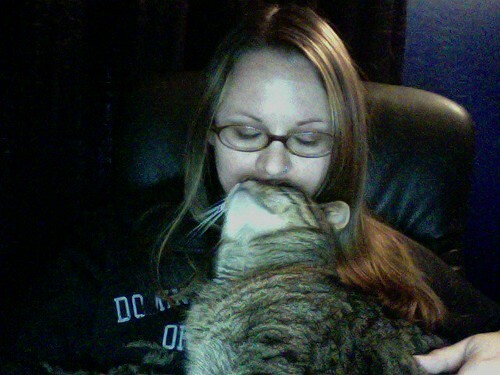 Right now Torgi is purring loudly while attempting to wedge himself in between me and my iPhone. He is winning.